Christmas never goes by, in the Shrewsday household without a rollicking good ghost story. We are late – I have been ill – but here is the first of four parts. Enjoy, and have a wonderful festive break. In the darkest recesses of the little shop in Pravdy Street, in the great city of St Petersburg, the frame stood blind. By blind, I mean it carried no mirror, though once it must have been made to stand on the dressing table of some impossibly rich and beautiful woman. It was carved in mahogany and had once been lavishly gilded by master craftsmen, but its crevices collected dust now, its unsettling features dulled by time and inattention. Old Gorokhin could not remember a time when it had not stood there, glowering from the corner of his little shop. His father before him told him it had arrived after the house clearance of a mad old military man, a recluse who had taken a house in the dense forest near the city. Gorokhin tried to ignore it. As a child it had elbowed its way into his nightmares, the grotesque faces carved upon it looming over him and threatening, the fronds of wooden tracery wrapping themselves round his face and suffocating him until he woke screaming. He always vowed he would sell it when the old man died. And yet when the event came, and he succeeded in doing a deal, it would arrive back within days. No-one would tell him why. Today, old Gorokhin walked with a spring in his step. For today, his grandson – still a teenager but with such a head for business – had finished a new marketing miracle. Ah yes, a portal to the world, his grandson told him: from today, his wares would not be confined to his shop – which had passed through generations, even through the Soviet era, trading quietly as an anonymous purveyor of second-hand goods – but now would be seen the world over, and his antiques would fairly fly off the shelf themselves, and riches would belong to Gorokhin and his grandson. Gleefully, the old man rubbed his hands together. He dared a glance at the blind old frame in the corner. Oh yes, he thought to himself, and you will be the first to go. And once you are across the other side of the world, you will be someone else’s problem, and I shall at last be free. He met the frame’s blank stare, and looked away, hurriedly. It did not do to tempt fate. It made Meg’s blood run hot and cold to think what they had put the old mirror through. Twenty years, it had lived in the household. Twenty years of children and dogs and battering: twenty years which had seen small three-year-olds testing to see if sandwiches could be posted through it, to teenagers applying far too much make up in front of it. It had witnessed sickness and health, accord and blistering rows, all human life. It had welcomed Meg as a new bride to her new home, and dispatched her daughter to her wedding after the bridal make up was firmly in place. And Meg was approaching half a century old now. Finally, there was a little money to spare, and finally, she had been offered the chance to make it up to her battered old mirror once and for all. It had been an antique when it was given to her as a wedding present, though with her shrewd eye she had long suspected the mirror was not in its original casing. It had arrived in a lovely warm mahogany frame which pivoted on a stand with a little drawer underneath which held all her make up beautifully. That was before children. Gradually the frame had fallen apart under the rigours of family life. The solid frame, the drawer, were long gone. But the mirror stood on the windowsill in the bedroom, right next to the view to the forest, and still did its daily duty. Every day Meg went out into the world having readied herself in its reflection. When time allowed, Meg measured the mirror and began her research. She knew she wanted something Russian. Something Imperialist. She did not know why. It was not an easy task. She had a budget to keep to: and she even had a picture in her mind of what she wanted. Something over-the top, she decided. Gilded, even. An example of that wonderful old carving out of the ramshackle workhouses next to Catherine Palace. An invocation of the imperial, with lots of greenery. And faces. Meg wanted carved faces on her mirror’s new frame. It took more than a year to find something, and Meg had all but given up hope. She would have to compromise, she sighed. She had no idea why she had settled on her strange list of demands, anyhow. She waited to be told that nothing matched her requirements. But no: she was politely informed that one match had been found to her search. Heart pounding, Meg clicked on the proffered link. And there it was. Terrible, wonderful, utterly excessive and even with traces of original gilding: a frame fit for her mirror indeed. It stood about 20 inches tall, 15 across: statuesque in black mahogany. It was a veritable wreath of black wooden ivy, each frond expertly traced out after a fashion only the Russians are capable of; and leering out of the tracery, looming in terrible gothic fashion, were the faces. If Meg was at all uneasy about those faces, her elation at finding such a close fit to her specifications was such that it obliterated all doubt. The frame was such a reasonable price – if she brought it across Europe and then found it not to her taste, why, she could sell it on quite easily. But she must see it, up close; must try her mirror glass inside and see the two united. If there were any problems – why, they could be remedied later. The arrangements were made quickly and the mirror dispatched. It was with almost indecent haste that Gorokhin’s packaged the frame immaculately, and addressed it to a small house in England. It arrived ten days before Christmas, handled by a specialist company who knew how to transport such beautiful objects with respect. Meg signed her name on the dispatch note. And all of a sudden, she was alone in the hall of her modest little house with the long desired, long anticipated frame. It was packaged with infinite care, and finished with string and brown paper. Meg fetched scissors and snipped the string, carefully unwrapping the frame until it stood before her. It was everything she had envisioned. Unsettlingly so. On a whim, Meg ran upstairs to find the sketch she had prepared for a local wood carver for a quote, at a time when she had almost given up hope of finding an original frame to fit her specifications. As she stood surveying the frame with the piece of paper next to it, her hand shook just a little. The two were almost identical. How uncanny, she thought, noting in herself a reluctance to look those carved faces in the eye. It was, however, quite magnificent. Meg did not think she had ever owned something so beautiful in all her life. It takes a dose of avarice to ignore the grimaces of carvings such as this, and Meg wished to possess this thing more than she had wanted anything for a very long time. Making a mental note to track down an excellent restorer and gilder, she took the frame and lifted it. Its weight surprised her: it was solid mahogany, yet light as a feather, as if designed to be lifted by a woman to her bedroom, and placed on the dresser. And so Meg padded upstairs delighted, and the mirror and its frame sat in the same space. Meg had the oddest sensation that the two had been expecting each other; but that was absurd, and she put it down to her own sentimentality. She was waiting for Dylan to return home from work before they headed out for the firm party. The light had faded, as it was wont to do in England in December, to almost nothing now; and it was time to bathe, and dress, and sit in front of her magnificent new mirror – in the light of the Christmas lights which Dylan had rigged up in the bedroom -for the first time, to do her make up. 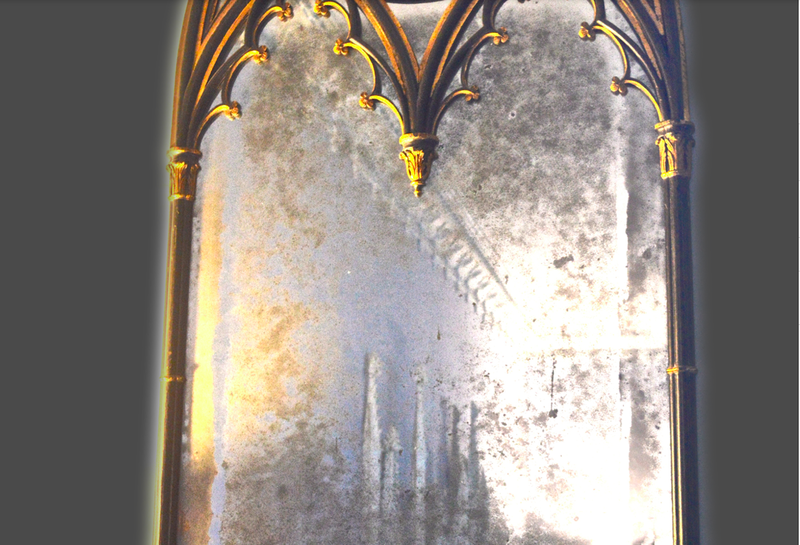 Not in all the time it had lived with the family – not in half a lifetime – had the mirror commanded such presence. It was stunning. Magnificent. The quality of the carving was masterly, and now the glass sat inside it acquired a grandeur which made it seem altogether unfamiliar. But elating, in a strange kind of way. Meg had had her heart set on a jewel-red dress she had bought especially for the occasion; but now she sat in front of the mirror, she knew there was only one option. She must wear black. As she readied herself, she was conscious of feelings to which she was unaccustomed stealing in on her, of thoughts most foreign creeping to the outskirts of her perception. She was suddenly aware of the brazen, barefaced moonlight streaming in from outside. The wind rustled the leaves of the forest almost with intent. And high up on the wall, a mother spider watched and waited: for what, Meg did not know, but she suddenly felt she must crawl inside that exoskeleton and divine what were the creature’s plans. Meg shook her head, as if to shed the thoughts and leave them on the floor at her feet. And then she met her eyes, in her reflection, in the mirror she knew so well. And she felt as though her heart stopped. Have you ever frightened yourself with your own reflection? Allowed your eyes to acquire a life of their own and channel what you imagine might be evil? If so, perhaps you can know a little of what happened next. This was Meg’s own face staring back – yet somehow younger and far more beautiful than she ever remembered herself – and her eyes held a terrifying energy. They stared back at Meg with an intent which seemed dark and fathomless, with a challenging malevolence. Meg tried desperately to turn her eyes away from that stare, to break the spell, but this was strong enchantment indeed. With every ounce of her being she labored to tear her gaze to the forest outside. As as she pulled – for that was the effort this required – something began to happen behind her reflection. Not in the room in which Meg was sitting, mind, but in the reflected room, an unreal place, a mere shadow of the real world. Meg began to be aware of a scuffling, scuttling sound. As if great rats were under the floorboards, or squirrels in the rafters, there in the reflected world. Yet rats and squirrels cannot speak, and with growing, immobile horror, Meg realized that she could hear words. They were in a foreign language. Sometimes they spoke together, sometimes separately, always with amusement, always with a cruel malevolence. What they were saying, Meg had absolutely no idea. This must stop, she thought, summoning strength to break that diamond-hard gaze. But the person in the mirror did not. Meg could feel the beckoning gimlet-eyed gaze, and her heart lurched. She began to feel nauseous and dizzy and knew, with a certainty, that soon, she would be conscious no longer. One can only fight these things for so long. Within seconds, the worlds faded to black. Posted in Spine Chillers, UncategorizedTagged ghost story, ghosts, Russia, St Petersburg, supernatural. Christmas, three partBookmark the permalink. This is magnificently gripping and chilling. Making readers wait for more is cruel and unusual punishment, though! btw – *triumphantly* I saw that ‘guilded’ before you zapped it! Ha! I could almost sense that you were skimming it, Co 😀 Glad you’re enjoying it. Oh, and sorry you have been unwell now, of all times, and I hope you are much better. Thank you, I am coming out of it slowly. Writing helps! Hope you are feeling better, Kate. Love to you and yours. The Shrewsday family is fortunate to have such a storyteller in their midst. This year’s offering is certainly off to an eerie start. So glad you’re feeling well enough to get back to writing. Thanks Kathy. Writing has been rather a poor relation his year. It is good to get back into the swing of things. Well, sleep will certainly not come easy tonight. 😀 I find a hot toddy most useful on these occasions, Lou: whisky, honey, cinnamon, cloves, all warmed…. I am so very glad to hear you’re on the mend. What a vile time to be ill. Thank you for giving us a story even so! Thanks, Kathy!! Have a great festive break! Rollicking good read. Hope you’re on the mend and that your illness didn’t prevent you all from enjoying the festive season. Hi Nancy, I have been writing through the ‘flu but life is beginning to take a turn for the more positive! Thank you for coming along to read. I’m late reading this, Kate, but I was determined. I know I won’t be disappointed. I hope you’re all better now. I refrained from eating any cheez-its yesterday, but I shall be bringing some when I see you in February!